Sample bowls of brinjal (eggplant/aubergine) family of bisque enamels. On the base of these bowls are usually a crudely drawn shop mark in underglaze blue within an underglaze blue double circle just inside the footrim. A special type of Kangxi period porcelain bowls were bisque fired without a porcelain glaze and decoration with incised floral patterns and the decorated with white, yellow and green on a purple ground are specifically known as 'brinjal bowls'. They also occur with other enamels such as aubergine, yellow or green as grounds, with the other colors used for the decoration. When white, the unglazed porcelain body is shown through a thin layer of clear glaze. The 'brinjal family' decorations occurs from late Ming, and stylistically develop during the Kangxi period - together with the Wanli wucai five color enamels - into the famille noire and the famille jaune decorations. 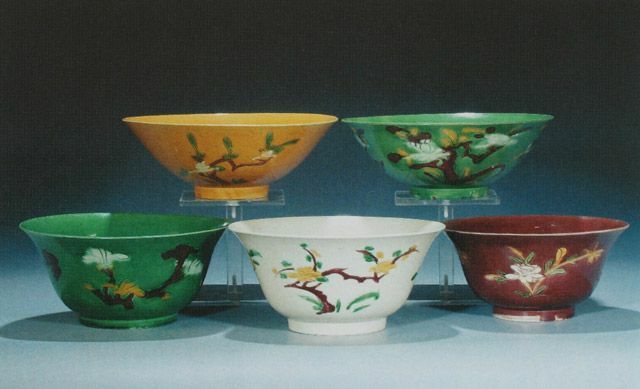 A special version of this kind of bowls are called 'egg and spinach' since they are decorated with yellow and green splotches. This decoration imitates the Tang dynasty 'three colored' sancai enamels. It occurs from late Ming and continues on into modern time.